If Sophie Kinsella is the queen of anything, it’s creating characters who feel like friends. Kinsella’s latest protagonist, Fixie Farr, is no exception. In I Owe You One, she has drawn a charming, soft-spoken woman in the midst of a true and proper coming of age. But Fixie isn’t looking to find her place. She’s already there. It’s her voice that’s missing. During her childhood, Fixie was aptly given her nickname because she wanted to—and could—fix absolutely everything. Everything except her own life, of course. When she loses her dad and her dream catering business in short order, Fixie comes back home to run the family shop, with her father’s all-important mantra, “family first,” always ringing in her ears. It’s ringing in her ears when her brother Jake belittles her or her sister Nicole refuses to do anything around the house to help, always claiming that Fixie can do it better. Fixie’s mother has always been her port in the storm, the place she can rest when her brother and sister take their grating on her nerves a little too far. But when her mother has a huge health scare—on the same day the Fixie’s childhood crush, her brother’s best friend and the man she is convinced is the love of her life, comes back saying all the right things—Fixie’s world turns upside down. Her mother goes on a much-needed extended vacation and leaves Fixie in charge of the family and the store in her absence. Immediately, Jake, Nicole and the absolutely insufferable Uncle Ned begin running the Farr family legacy into the ground. Nicole, who claims she is in need of constant “self-care,” because her husband, who she won’t go visit or even talk to on the phone, is in Abu Dhabi, insists on redoing most of store to accommodate a yoga space. Jake, who seems far more intent on impressing his fancy friends and discussing the posh new Notting Hill location for Farrs that is a total figment of his imagination, tries to change everything to accommodate his friends’ absurdly expensive products that are not in any of their usual clients’ price ranges. And, while Fixie tries to convince herself that Ryan coming over twice a week to let her cook for him is a dream come true, even she can’t deny that something isn’t quite right. Even still, everything else on her plate can’t being to compare to how her life changes when a stranger in a coffee shop asks Fixie to watch his computer. When the ceiling falls, she saves his laptop, which is essentially akin to saving his life, and a simple IOU sets off of a chain of events that Fixie never could have imagined. What starts as an ask for a job for her struggling boyfriend leads to a back and forth exchange of favors that connects the two as friends. It is these very exchanges that ultimately lead Fixie to rethink her life and the meaning of unconditional love and even causes her to reconsider the one thing that has been a constant in her life: the way in which she has always fixed everything and everyone around her. Fixie finds that sugar coating the truth and always hiding her feelings isn’t, perhaps, the best way to put her family—or herself—first. 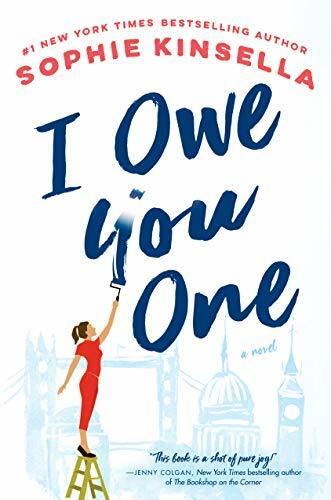 With Kinsella’s typical warmth, wit and moments of true, laugh-out-loud hilarity, I Owe You One is another winner from a true master of the feel-good story.